Hands-down, not kidding, this is the ONE challenge that my students love, beg to do again, and cheer when they see it on our agenda. So, I am sure you want to know why it is the best challenge ever! Why is this challenge so popular? It's easy, easy, easy to set up! The materials can be re-used for a long time. It includes learning about momentum, acceleration, potential and kinetic energy, centripetal force, and plenty of trial and error. In the end, kids build lots of loops and try over and over to make them work. It's just plain fun! Sounds like a win-win- right? This has to be a consideration when choosing a STEM Challenge. I can also highly recommend a challenge that involves pancakes! It's also a much-loved and much-requested challenge for my students. But, the prep is time-consuming and the clean up is really, well, a lot. Roller Coasters, I promise, is easy. The Roller Coaster involves three things and the prep is a one-time event. Let's start with the foam tubes. The foam tubes we use are insulation tubes for copper pipes. I bought the 1-inch pipe style. The tube has a larger diameter, but it is designed to cover a one-inch copper pipe. I bought so many that I also took the box they came in and that is what I use to store them now. The type of tube I found already had one side cut open and the other side had a tiny groove in it. I used that groove as a guide to cut the tubes completely in half. Each team will need three pieces (halves). You will also need masking tape and a lot of it. This is when I pull out the 99 cent rolls of tape- which I find at Walmart. And, you will need the teacher's guide and lab sheets. This resource is divided into three sections. On Day 1, students experiment with learning how the hills of roller coasters work. They try building small first hills and tall second hills to see what will happen. Take a look below! We attach the end of the tube to a table and that point is the top of the first hill. This team has created a second hill taller than the starting point. Will the marble be able to climb that second hill? Day 2 and Day 3 are also outlined in detail. 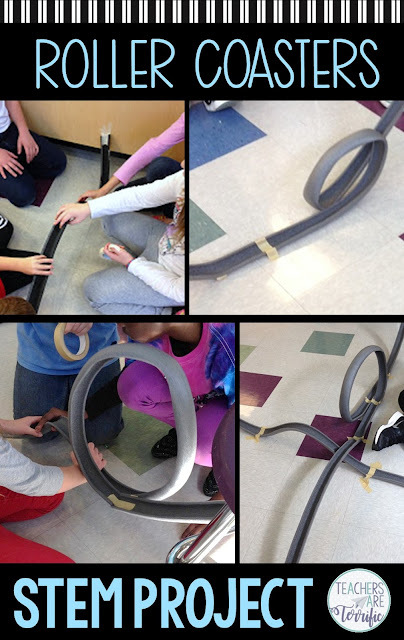 Students will work through experimenting with hills and loops and finally move on to freely designing their roller coasters. The resource is color-coded and includes a table of contents to walk you through each day of the event. Super easy, I know! You need tubes (that can be stored and used again forever), tape, and the lab sheets for kids. The resource also includes a lengthy page of extra information about roller coasters. The experimentation with the steepness of hills is such a great learning experience. Students really think that much higher second hill will work and are quite stunned when it does not. We learn the word momentum during this trial. During the second day of experiments we work with loops. Creating loops is a little tricky. The loops cannot be too large or too small. They have to be aligned with the rest of the track and the marble has to have enough momentum going into the loop to travel through the whole thing. Before we start working with loops we do talk about why they work. How does a roller coaster passenger car stay on the track when it travels upside down? Inevitably, students will say the car is attached, which it is, but what if it wasn't? What if the passengers were not in a harness? Would they still stay inside the car? The answers to those questions are surprising! This phenomenon is called centripetal force and I included a tiny demonstration in the resource you can try with your students to help them understand what it means. Basically, the marble (passenger) is going to stay within the loop if it has the speed it needs to travel through the whole loop. It's the grandest time ever! This challenge is the best just for the fun factor. Kids love it when they finally have three tubes and can design freely. They try multiple loops. curves, and wacky systems that will somehow work. In the photo above you can see what happens when two teams intersect their tracks. Even though my classroom is quite large we still have roller coasters that run into each other. Kids cleverly find a way to fix this! Try this one! It's a spectacular event full of learning and fun and noise and groaning and cheering. It's the famous Roller Coaster Challenge!